Mariya Tkachyk was born in Lviv in 1982. She studied violin at the class of Marta Hunevych in Lviv Solomiya Krushelnytska Special School of Music. In 2000 Maria entered Mykola Lysenko Lviv State Academy of Music, where she studied under supervision of Professor Ihor Pylatyuk. During her studies, Mariya took part in many master classes, including Zakhar Bron master classes (Poland, 2002), International Summer Academy Prague-Vienna-Budapest (Austria, 2003), etc. In 2002 Mariya was an award winner of Mykola Lysenko International Music Competition. In 2003 she became a laureate and winner of the Special Prize of Carl Flesch International Competition (Hungary). In 2008 Mariya finished her postgraduate studies in Mykola Lysenko Lviv State Academy of Music, in the class of Ihor Pylatyuk. Since 2010 she has been a concertmaster and principal violin of «INSO-Lviv» Symphony orchestra. 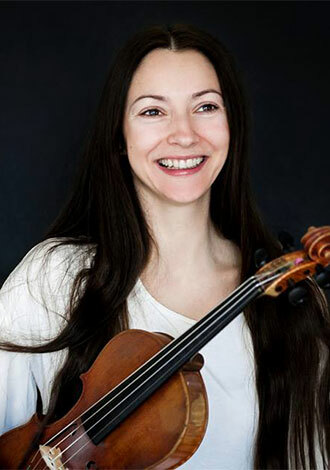 Maria Tkachyk participates in many international projects and festivals as a solo performer and as an orchestra member held in Ukraine and abroad (Germany, the Netherlands, Italy, Poland, Switzerland). Mariya has collaborated with such conductors as Georg Kugi (Austria), Fahraddin Kerimov (Azerbaijan), Reinhard Seehafer (Germany), Raymond Janssen (the Netherlands), Oksana Lyniv (Ukraine – Austria), Myroslav Skoryk, Volodymyr Syvokhip, Natalia Ponomarchuk (Ukraine) to name the few. Mariya’s repertoire includes works of contemporary composers such as Giya Kancheli, Sofia Gubaidulina, Myroslav Skoryk, Vadim Neselovskyi, Benjamin Clementine and many others. She took part in recording of «8 Concertos for Violin and symphony orchestra by Myroslav Skoryk» CD where she performed solo in Concerto № 1.